In 2017 the New Zealand Parliament saw the introduction of legislation designed to make vacant the seats of representatives who left their political parties of election, be that voluntary or not. This was not the first or even the second attempt to legislate in this area but the third. This article considers this proposed law from the perspectives of constitutionality and effectiveness. What can New Zealand’s legislative history tell us about whether this legislation will be fit for purpose? Absent an election, should the courts or the legislature decide the membership of the legislature? What is the impact on the core constitutional freedoms of expression and association and is their restriction justified? 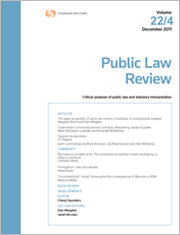 This article considers two related aspects of retrospectivity in statutory interpretation. The common law presumption against retrospective law-making and the manner in which the ‘always speaking’ approach may occasion the sort of retrospectivity which is of concern to the common law. It critiques the common law conception of retrospectivity that currently attracts the presumption’s protection. Then it explores the relationship between the ‘always speaking’ approach and retrospectivity. It is suggested that serious consideration ought to be given to whether an alternative, prospective construction of a (criminal) statute might be available when the application of the ‘always speaking’ approach would give it a strong retrospective operation. New Zealand’s statutory and regulatory environment is becoming ever more complex in order to respond to the demands of an increasingly technologically and socially diverse world. For lawmakers, this creates significant challenges. One design option is the inclusion in a Bill of the controversial “Henry VIII clause”. As conventionally understood, such clauses enable the executive branch of government to amend, suspend or override Acts of Parliament. They offer expedited lawmaking but can come at a significant cost in the light of their constitutional implications. This article argues our current usage of the term “Henry VIII clause” needs to be fundamentally recalibrated so that, while acknowledging the constitutional significance of those clauses, the question of whether they are constitutionally objectionable is assessed on a case-by-case basis. For the PDF version of the table of contents, click here: PLR Vol 29 No 3 Contents.